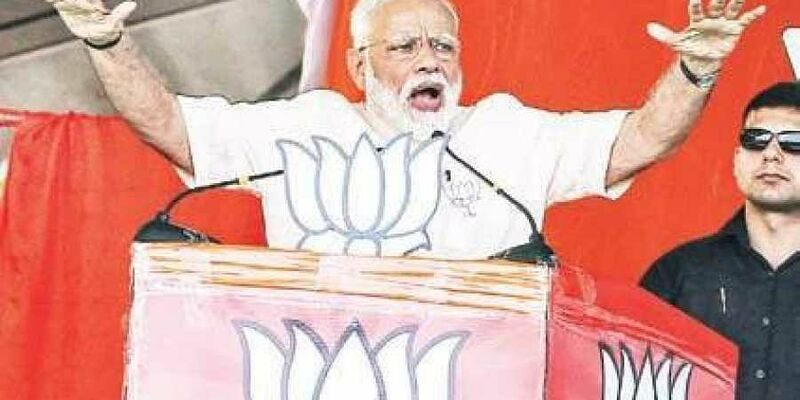 On his second visit to the State in less than two days to campaign for his party’s Assembly and Lok Sabha candidates, Modi addressed an impressive gathering at the Arts College ground here. RAJAMAHENDRAVARAM: Launching a vitriolic attack on Chief Minister N Chandrababu Naidu for ‘treating’ Polavaram as an ATM, leading to escalation of its cost, Prime Minister Narendra Modi on Monday said that the Centre had till now given Rs 7,000 crore for the project. Modi accused Naidu of working to preserve his own ‘Heritage’ and stooping to such lows as to commit cyber crime by stealing citizens’ data through the TDP’s ‘Seva Mitra’ app. The BJP’s star campaigner even likened Naidu to Bhallaladeva of the Telugu blockbuster ‘Baahubali’, which portrays the character as the one who wants to acquire power by hook or crook. During his speech, Modi was unsparing in his criticism of Naidu while showcasing his government’s initiatives for the welfare of the people in the country, and in the twin Godavari districts in particular. As usual, Modi started his speech in Telugu and recalled the great history of the city. “The NDA is committed to the development of this region and the entire State,’’ Modi assured. On one of his government’s initiative, which came into effect on Monday, Modi said taxpayers with income up to Rs 5 lakh were now eligible for a full tax rebate and individuals who invested to the tune of Rs 6 lakh were also kept out of the tax bracket. “This demand (of income tax rebate) of middle and small income groups fell on deaf ears till now. Now, we have heard them and this will come into affect from today itself,’’ Modi said. Modi claimed his government kept up the pace of development without raising any taxes in the past five years. “The previous governments did not purchase Rafale jets citing fund shortage,” he said, taking a swipe at former Defence Minister AK Anthony’s recent remarks on the issue. Turning his ire on Naidu and calling him a member of the ‘maha milavat’ (adulterated grand alliance), Modi said the Polavaram project was an example of the style of functioning of the previous governments. “It (Polavaram) was in cold storage for the past four decades. The governments, including the TDP’s, should be blamed for it,’’ Modi said and added that his government accorded national status to the project and released around Rs 7,000 crore for its execution. “The TDP government, however, does not want to complete Polavaram and is not spending the allotted money properly,” he said. As a result, the project cost escalated. “Polavaram is the lifeline of farmers and quenches people’s thirst. However, for the U-turn Babu and TDP, Polavaram is an ATM. They draw money from it,’’ Modi alleged. Referring to the alleged data theft case, Modi said the TDP had resorted to cyber crime through its Seva Mitra app. “There is neither seva (service) nor mitra (friends). They (the TDP) have stolen data of the people of the State. If they can steal your data, imagine what they can do to the State!’’ Modi said the ‘Chowkidar’ government had sneaked into the enemy’s territory and killed terrorists, but the leaders of the ‘maha milavat’ were making comments favourable to Pakistan.